I was asked by @The Darkprogramer to post this. Everything else is from him. Yugonibblit, Gtx, cfwprophet and 10 others like this. Nice work @The Darkprogramer ! Do you plan adding any new features? I have one idea to make app better. 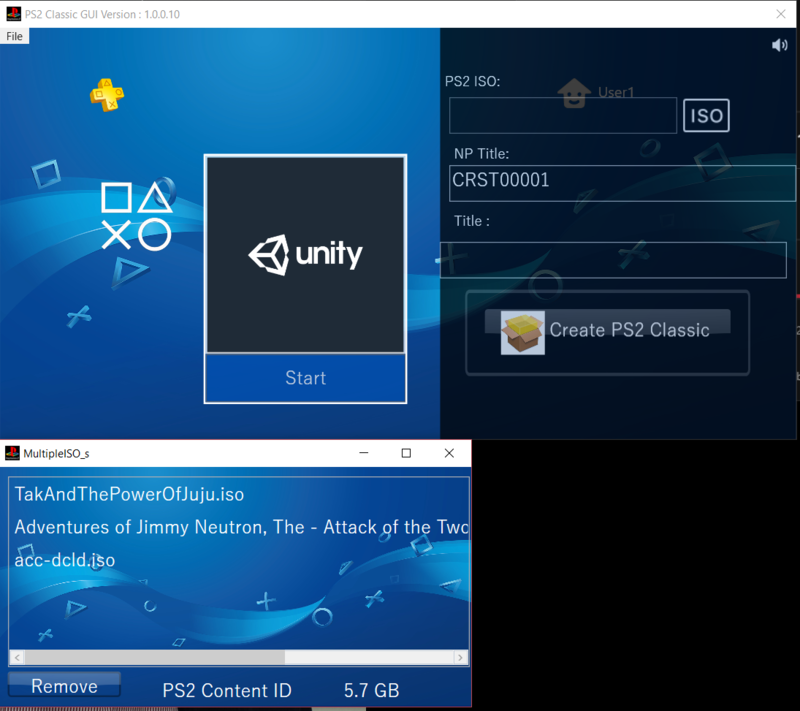 Option to use custom config-emu-ps4.txt file. But in noob friendly way, so normally default config is used. But for example when click on "add custom config" then user can select his custom file instead of default one. This will be nice improvement as many fixes for games can be added that way. For example to run Valkyrie Profile 2 you need custom file, it fail to boot on default. Also support for adding folder/file: patches/YYYY-XXXX_config.lua will be nice addon, because thru this file we can use raw memory patches (like pnach in pcsx2). Is needed for example to run game Oni, or to (partially) fix WRC games. Anyway, nice work as is. Simplest way to create PS2 PKG. Zazenora, Yugonibblit, cfwprophet and 6 others like this. Yugonibblit, cfwprophet, T.A.U and 2 others like this. STLcardsWS, Yugonibblit, cfwprophet and 3 others like this. but I get "format of the project file is not valid invalid attribute content_id = up9000-BOOTELF_00-BOOTELF00000001" any ideas? Yugonibblit and cfwprophet like this. A PS4 example is CUSA00002_00 (Killzone: Shadow Fall). Yugonibblit, cfwprophet, UniqueUserName and 1 other person like this. Yugonibblit, cfwprophet and The Darkprogramer like this. Yugonibblit, cfwprophet and UniqueUserName like this. Yugonibblit, cfwprophet, UniqueUserName and 3 others like this. Yugonibblit, cfwprophet, STLcardsWS and 1 other person like this. Yugonibblit, STLcardsWS, cfwprophet and 1 other person like this. After it installs the update and i click the program to load it up, it just says it's verifying the the program it could take a few moment, then the dialog goes away and the program never loads up for me. I think he got the same issue as I, and only setting custom path will help. But i can't remind where file that need to be changed is. Sorry i didn't respond sooner, i have been pretty busy, but anyways. I have restarted many times, I uninstalled it, restarted, then reinstalled and restarted again. The old one in the folder will open but then if i click the desktop shortcut it tells me that a newer version is available, So i click next and all my desktop icons refresh. Because I have already downloaded the latest version. Then if i click the one in the folder it refreshes my icons once again. It's really weird. I don't know how else to explain everything. Hey, very nice tool. Thank you for this. I was happy to try "Buzz" with the wireless controllers and realized that the controllers dosen't work. Also the Buzz controllers with cable doesn't. Is there a way to make these work on PS4? That would be awesome.